Resumes and Rapsheets is a Stellar Wind Player’s Aid. 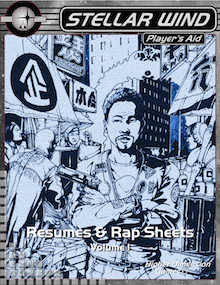 Player’s Aids are small works that provide useful tools for both GMs and players. This aid consists of ten notable NPCs for use in your Stellar Wind game, four of whom are characters from the core rules short story: Nathaniel Gregory, thief-for-hire; Spider, cybernetically-enhanced information broker; Orla Devors, stunningly beautiful and deadly goods-man; and Sen-Lin-Ban-Dren-Mon, insane Skelkess collector of rare antiquities. Each NPC includes a portrait, complete stats, skills and skill levels, a short psychological and physical profile, and a complete description detailing mannerisms, interesting facts and where the NPC is typically encountered. This title was added to our catalog on October 06, 2011.